It’s pretty overwhelming even picking a hand soap at the store these days - there are your old fashioned bar soaps, liquid soaps, foam soaps, and all are offered by different brands. Bar soap has always seemed a bit gross to me when sharing with others, and foam soap reminds me of public restrooms, so we use liquid soap. 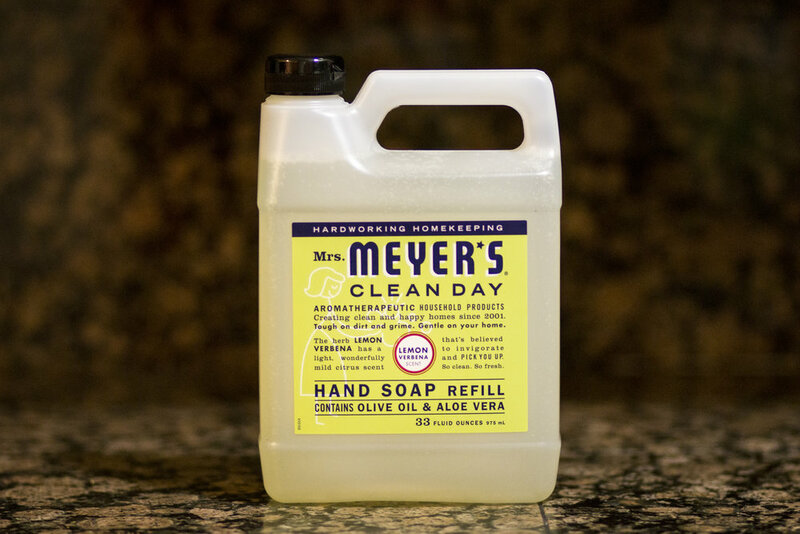 After lots of trial and error, we landed on Mrs. Meyer’s Clean Day as our go to soap. There are a few reasons to like Mrs. Meyer’s Clean Day. It’s made with all natural ingredients. There’s an ingredients glossary on their website, so if you have any questions about anything in your soap, you can always reference their guide. Once you know what you’re washing your hands with, it comes down to the cleaning power! This hand soap leaves your hand exceptionally soft while really cleaning your hands well! The most impressive thing in my eyes is the way it cuts through grease. I used a small bit of it on a cast iron pan that was caked with grease and the soap cut right through it. It definitely impressed me. On top of those reasons, it’s not expensive! I can find it at the store for under four bucks. Next time you’re in soap aisle at the store, give this a chance - I think you’ll be really happy with it!